'Serious and disturbing allegations' or just petty revenge? Washington Post: Comey "painted a picture of a president grossly abusing his executive authority," write the editors. "However Mr. Trump and his allies may spin the testimony, these are serious and disturbing allegations." It also called out Republicans who sought to minimize the "transgressions." That only makes "those senators look small." Wall Street Journal: Comey "is trying to have it both ways," complains the editorial page. "He worked to leave the impression that Mr. Trump had committed a crime or at least an abuse of power, even as he abdicated his own obligations as a senior law-enforcement officer to report and deter such misconduct." That is, if he believed Trump was obstructing justice with his requests, why didn't he do something then? It feels like his motive now is "more revenge than truth-telling." 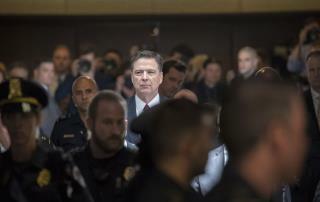 New York Times: Comey "deftly recast his confrontation with the president as a clash between the legal principles at the foundation of American democracy, and a venal, self-interested politician who does not recognize, let alone uphold, them." Specifically, the editorial board faults Trump for being seemingly unconcerned about Russian meddling in the election. Washington Examiner: It focuses on Comey confirming that Trump wasn't personally under investigation. Previously, "the media speculated on an investigation into Trump and laughed off his claim that Comey told him he was no target. But Trump has now been shown to be right. Comey has not shown any good reason for withholding the truth. Trump had good reason to be angry." Chicago Tribune: Let this play out. "Comey's testimony damaged the president's credibility. But complex investigations take twists and turns and don't conclude quickly. In time the country will learn enough to render judgment. Were Trump's actions permissible, inept, or nefarious?" Well, at least that list makes it easy to see who is biased and who is more centric. I only read one that seemed centric, and logical. I think the Chicago Tribune got it right... Let this play out. Meanwhile, Sarah Huckabee Sanders' statement, "I can definitively say the president is not a liar," is so far from reality it would be laughable if the situation weren't so serious. It has been shown time and time again that Trump is little more than a self aggrandizing liar.